1. A succulent necklace that comes in both day and night colors. Promising review: "This is now my favorite necklace that I own. 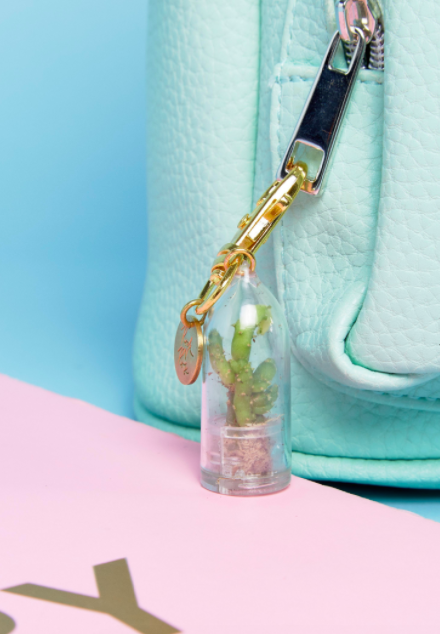 I'm borderline obsessed with plants, and being able to wear a wonderfully illustrated terrarium in enamel form is perfect." — Alisha W.
2. A pretty half moon planter. 3. A T-shirt with a printed pocket filled with succulents. Promising review: "This is so clever and cute! Good quality. I got the sweatshirt as a gift for my girlfriend who has a succulent design shop and she loves it! She's a supermodely 6 feet tall and the large fits her comfortably, not too short. Love it! And it shipped quickly before Christmas. Yay!" — Courtney M.
Get it from Bee's Pocket Tees for $15.99+ (available in sizes S-XL). 4. A pack of live succulents to plant. 5. A nine-piece set of tools for pruning, cleaning, planting, and perfecting your plants. Promising review: "Such a great little gardening tool set! They are perfect for succulents...you have pretty much everything you could ever need for planting, cleaning, and propagating your plants. Everything comes individually wrapped and held in a nice little clear plastic case for easy storage. My expectations weren't too high — considering the price — but I was very pleased with this tool set!" — Kasey M.
6. A set of two hexagonal planters. Promising review: "These were exactly what I needed for the succulent plants I started late this summer. I wanted to be able to separate them, as I have two that will go dormant over the winter. They are perfectly sized, sturdy, include small drainage holes at the bottom, and have nice little bamboo saucers that they rest on. And good looking to boot. Highly recommended." — Kasey M.
7. A highly-rated misting sprayer that's pretty, too. Promising review: "The plant mister is just pretty! I couldn't wait to use it after I got it. Now it is beside my little flower pots, as part of the decoration. Besides pretty, it works great, too! It is easy to spray water, very uniform. Every year I bought a plastic plant mister and had to through it away several months later. This one is the most expensive one, buy every penny is deserved." — J.Q. 8. A silicone wall planter that sticks to windows and shiny, flat walls. Promising review: "Love love love these little gems! I have them stuck on my bathroom mirror and they look adorable. Great product. Highly recommend." — Sammy P.
Get them from Urban Outfitters for $12 each. 9. A glass pentagon terrarium to fill up with plants. 10. A set of three cactus and succulent pins. Promising review: "BEAUTIFUL! I love that it was rose gold colored, as well. Thanks!" — Rafella G.
11. A pair of wall planters with enough space for a succulent or two. Get them from Amazon for $24.62. 12. 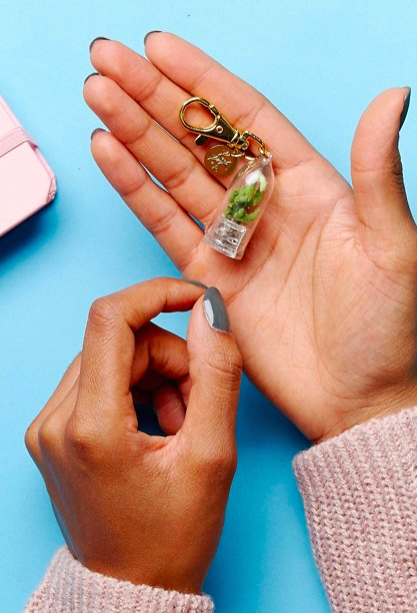 A necklace with teeny-tiny succulents made from polymer clay. Get it from sofoxyclay on Etsy for $35. 13. A set of succulent planters in the shape of owls. Promising review: "Cutest pots ever! Love them! They are perfect for the small succulents from the store or if I am propagating some smaller plants. I have them throughout the house, including the kitchen window and on our sunny patio. The drainage hole on the bottom is sufficient. Pots came without any being cracked or chipped." — Natasha H.
Get them from Amazon for $12.70. 14. A necklace with an actual living succulent inside of it. Get it from Amazon for $7.99 (plus $3.49 shipping). 15. A garden journal to help keep track of what's been planted and when to water plants. Get it from TheFarWoods on Etsy for $20. 16. A hanging glass terrarium kit. Promising review: "I'm loving my little garden in my bathroom window. The plant I chose was a small cactus. Five stars." — Robert M.
Get it from Amazon for $13.95 (available in teardrop or globe). 17. A VW bus-shaped planter for extra good growing vibes. Promising review: "This is awesome, great work it’s so nice. Gave it as a gift with potted plants in it." — Trina M.
Get it from IronMaidArt on Etsy for $45. 18. A set of 10 notecards to express your succulent love. Promising review: "Very well-packaged cards, very fast delivery. Excellent friendship cards for my friends who are graduating!" — Mengjin S.
Get them from ChampaignPaper on Etsy for $10. 19. A pair of monochrome hanging wall planters in two sizes. Get them from West Elm for $19 (small) and $29 (large). 20. A pair of tiny succulent earrings made from polymer clay. Promising review: "Bought these as a gift for my coworker and love them! Perfect price, nice simple packaging, and arrived on time. Thanks!" — Spencer B. Get it from MargaretsShop on Etsy for $10. 21. A colorful laptop skin that'll help you forget that you're working in an office and not outside in nature. Promising review: "Looks great! Love that the design is on a transparent back, as well. Many just cover the front. Very pretty design and well-made!" — Mary Anne S.
Get it from MarmoriAlbo on Etsy for $44.99. 22. A dainty ring featuring a silver sedum plant. Promising review: "Very pretty ring. Fast delivery. I'm happy." — Linda M.
Get it from AWildViolet on Etsy for $38 (available in two finishes, sizes 2-12). 23. A sweatshirt that'll proudly display your plant love. Promising review: "I love this so much, have received so many compliments and I wear it everyday!" — Para M.
Get it from RealRebel on Etsy for $24.99 (available in two colors, sizes S-XL). 24. A book to help take any succulent grower to the next level. 25. A watch with a succulent print underneath its glass. Promising review: "Very stylish, good quality. Looks just like the picture. I appreciated that an extra battery was included." — Nicole W.
Get it from FreeForme on Etsy for $13. 26. A house-shaped glass terrarium to fill up. Promising review: "Great deal on a mini green house. The glass and seams are well put together and it is just right for a small space to create a tiny garden. I used the plant list with a timer to grow this at my desk. Has become a little hobby project that makes me happy every time I look at it." — James M.
27. A ceramic "Plant Lady" mug. Promising review: "Adorable mug. Feels great in the hand and the color looks beautiful in person. The packaging it came in was also beautifully done. I opened the box and smiled. Highly recommend!" — Kate K.
Get it from Rosalynnelove on Etsy for $15.50. 28. A candle with a succulent-shaped top. Get it from Anthropologie for $30. 29. A pair of socks with our favorite plant as the print. Promising review: "I LOVE this little planter. My succulents look adorable in it, and I also really appreciate the draining hole and the saucer that comes with it. Very happy!" — Danielle W.
31. And a keychain with a real live prickly cactus inside.